In an era where online hacking and database hijacking are normal things, securing one’s data can turn out to be a difficult task. Gone are the days when a locker could serve the purpose, the entire base has now been shifted to e-commerce through virtual money. Why to waste millions of money when one can save his data in the mobile phone by spending a few bucks! Though key chain was introduced by Apple with iOS 7; it couldn’t cope up with the advancement of technology. It will lock down the data behind a four digit unlock key or a master-key and saves it even if the device is stolen. Using the free Dropbox service, it can easily be synced with 1Password for Windows and 1Password for Mac. Sync can be bidirectional and it also supports background syncing. 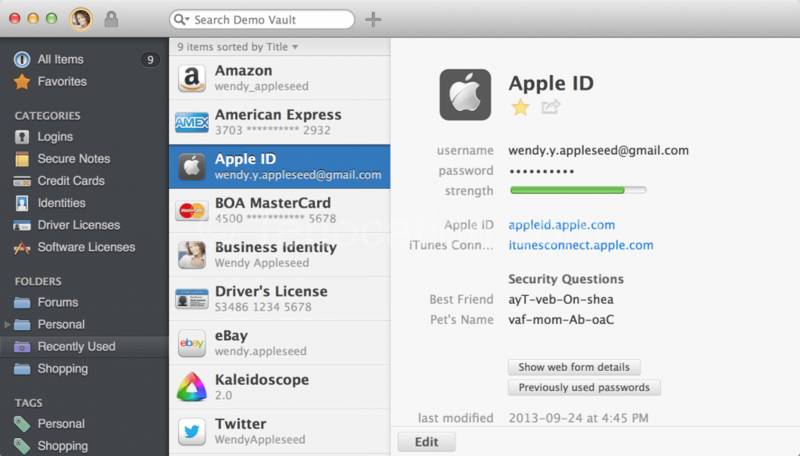 While accessing any other application, 1Password can be locked down or set to a timer. It is also known as a universal app as it supports iPhone, iPod Touch and iPad. No matter what platform one is using, the app just encrypts the backup of data on the computer. One just needs to tap on the password and username which will take the user to the concerned website as the app has a browser built right into it. It’s not just he built-in software that is great but the graphics associated with the app serve the purpose to the full extent by justifying to its good built up quality. The application has received some great reviews since its launch and the company has been updating the software ever since. It runs smoothly on every platform. There cannot be any sole reason to justify the number of downloads and the type of reviews it’s getting. The first step to use the application is to install it into the desired gadget from the apple store after which one will need to enter a four digit number to login into the software. It is one of the best applications till date with very high user’s rating to secure the data. The software development team has already come up with an update named 1Password Pro. It is one such app that will only get new terms as the days go by. So don’t delay and get it now.